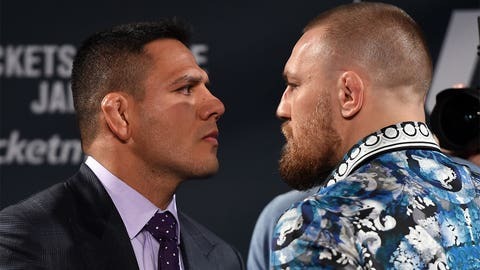 Neither Rafael dos Anjos (L) nor Conor McGregor (R) are cowards, but that hasn't stopped both of them from lobbing that charge at one another. Conor McGregor rightfully gets a lot of credit for his gutsy willingness to fight anyone, regardless of the weight class or notice. In his most recent bout, he fought up two weight classes against Nate Diaz. Last summer, he took Chad Mendes on on short notice when his original opponent – Jose Aldo – was forced out with injury. Of course, Mendes and Diaz both deserved at least equal, if not more, credit for fighting on short notice, but we can all agree that among all the things he is, McGregor is most certainly brave. Well, all of us perhaps except UFC lightweight champion Rafael dos Anjos. In a tweet, the Brazilian called McGregor a "coward" for once again putting off his first featherweight title defense. It isn’t that McGregor has gone a long time without defending the belt he took from Aldo in December – it has been only a few months. Dos Anjos’ point is that McGregor put his first defense off twice now, to move up in weight. First, he did so to challenge dos Anjos at lightweight before RDA got injured and pulled out, and McGregor fought Diaz. Now, the Irishman has signed on for another higher weight class fight in July at UFC 200 – a second try at Diaz. This means that the featherweight division will continue to be held up for at least another half year or so as McGregor pursues glory against bigger men. It also means that the likes of No. 1 featherweight contender and former lightweight champ Frankie Edgar will continue to wait to fight for a real belt, as will longtime divisional kingpin Aldo. Aldo and Edgar will fight one another the same night that McGregor rematches Diaz, and will be fighting for a silly interim tag. Dos Anjos said he feels bad for them, as he insulted McGregor. Obviously, RDA brings up a good point about fairness to top featherweight contenders like Edgar and Aldo with regards to McGregor getting any fight he wants these days. Clearly, he’s just as wrong about McGregor being a coward. Just as wrong, it just so happens, as McGregor was when he said the same types of things about dos Anjos time and again.